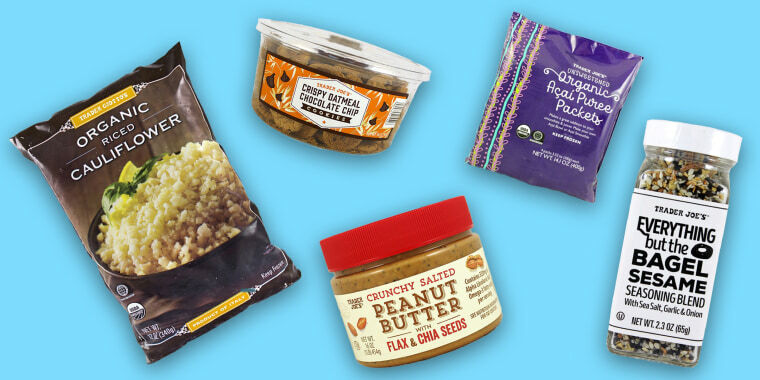 We know TODAY Food fans really like Trader Joe's, but we also know that in addition to grooving on cookie butter, plenty of TJ's fans are after more health-conscious finds, too. So we asked TODAY's contributing health and nutrition experts to share their favorite healthy foods from the budget-friendly brand. Here are their top finds for dinner, sides, snacks and more. Trader Joe's riced cauliflower, which comes in refrigerated and frozen versions, is so popular that there have been rumors of rationing. It's a convenient, low-carb stand-in for rice and gets a big thumbs up from nutritionists, too. "Cauliflower 'rice' is hands down one of my favorite healthy food finds," says Joy Bauer, TODAY nutritionist and founder of Nourish Snacks. "I typically make my own, but it's great to be able to skip a few cooking steps on hectic weeknights and get dinner on the table faster. Plus, I have one less mess to clean up." Try it in a tasty Cauliflower "Risotto" with Wild Mushrooms or in Cauliflower Fried Rice. Keri Glassman, MS, RDN, is another fan of TJ's riced cauliflower and she also loves the store's frozen stir-fry veggie mix. It's easy to top either (or a combo of the two!) with protein and have a complete meal, says Glassman, who covers her favorite healthy frozen foods at Trader Joe's on the blog Nutritious Life. 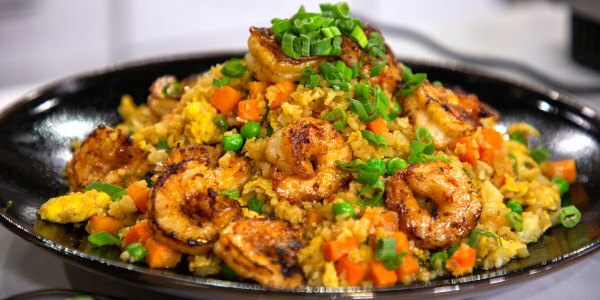 Looking for some protein to top that veggie stir-fry or cauliflower? 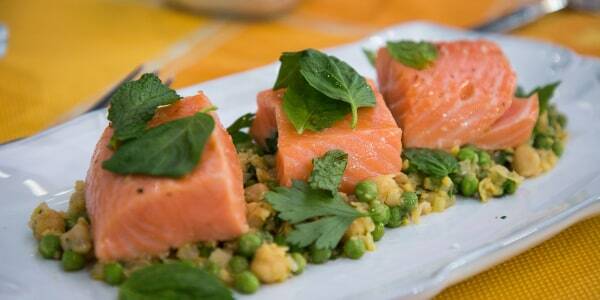 Glassman likes TJ's frozen wild salmon, which is a great source of protein and heart healthy omega-3 fats. "Since Trader Joe’s sells its own brand, it’s also super affordable compared to your local fish market," she notes on her site. Keep fillets on hand in your freezer, they're easy to thaw and will be ready to use in any salmon recipe. "Trader Joe's sells some of the best frozen fruits and veggies — they often look like they did while they were fresh — they retain their color — and they are flavorful," says Bonnie Taub-Dix, RDN, creator of Better Than Dieting. "Their labels, for the most part, show recognizable ingredients, but it’s best to read labels carefully to be sure you’re not buying items that have added sugar or other ingredients that might be best to avoid. So, if you’re buying frozen mangos or raspberries for your smoothies, the ingredient list should contain just mangos or raspberries." And, adds Taub-Dix, "Many people don’t realize the value of frozen food and that, in some cases, it could even be better than fresh regarding nutritional value." A TJ's favorite among TODAY staffers, Trader Joe's peanut butter with flax and chia seeds gets the thumbs up from NBC News health and nutrition editor Madelyn Fernstrom, PhD, who praises the product for being free of added sugars — and for the addition of flax and chia seeds, which she notes "provide taste, crunch and more than 300 milligrams of additional omega-3 fats per 2 tablespoons and a satisfying 170 calories." Slather it in sandwiches, eat it by the spoonful or use it to make these mess-free celery snacks. "Açaí bowls at smoothie shops are usually sugar bombs," says Joy Bauer. "I use these açaí packets to make my own bowls at home with all my favorite fruit toppers. Since they're unsweetened, I know exactly how much sugar is going in." Another bonus? Making açaí bowls at home will save you cash! Try açaí, which Glassman notes may help fight inflammation and contribute to heart health, in this Açaí Bowl recipe from nutrition expert Ellie Krieger. These roasted broccoli bites, found in TJ's snack section, are a favorite "low-carb, crunchy and healthy midday snack" for TODAY contributor Kristin Kirkpatrick, MS, RD. "It's like a New York bagel in a bottle — without all the carbs," Bauer says of this sprinkle-on blend that includes sesame seeds, poppy seeds, sea salt, and dried minced garlic and onion. "I'll add a dash to my light cream cheese and spread it on a whole grain English muffin with a slice of tomato. It's a fun and easy way to add flavor." Sure, you can buy arugula at most grocery stores these days, but Fernstrom likes the price at Trader Joe's. "At just $1.99, it's a fresh produce bargain. 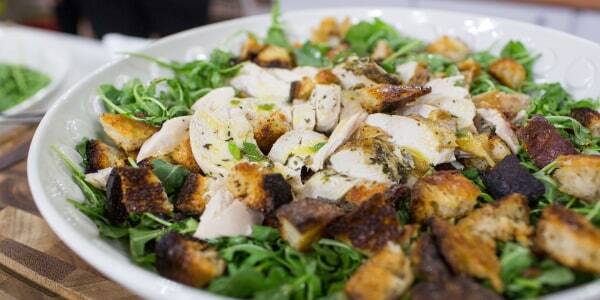 You get a big bag of fresh arugula to perk up any salad, or eat on its own. The tangy bite of arugula makes a great salad alone, with some lemon juice and a splash of olive oil, or added to any mix of fresh greens. It's a great intro to dark greens for those who are new to darker, tangier greens." Try it in a 5-Ingredient Watermelon, Feta and Arugula Salad or in Siri Daly's Bow-Tie Pasta with Arugula Pesto. "I don’t know about you, but I like to chew my fats," says Taub-Dix. "I’d prefer for the fat source on my salad to come from nuts or avocado, instead of oil since they provide a more impressive mouthfeel and they can help you feel more satiated." Her solution: using Trader Joe's balsamic glaze on salads rather than an oil-based dressing. She notes that one tablespoon of the glaze contains just 40 calories, compared to a tablespoon of oil which contains about 130 calories. Plus, she says, the glaze goes a long way when drizzled decoratively over a salad. Try it on that wild arugula, or, as Taub-Dix suggests, drizzled on top of strawberries or melon: "It will make your taste buds sing!" "I love to use this dough as a vehicle for veggies," Bauer says of this shape-and-bake dough. 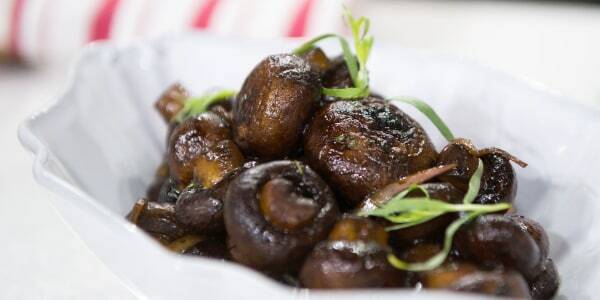 "I'll add some tomato sauce, cheese, and then pile on the mushrooms, peppers, spinach and broccoli — and lots of red pepper flakes! By choosing whole grain you'll add some nutrition and fiber to your slice." 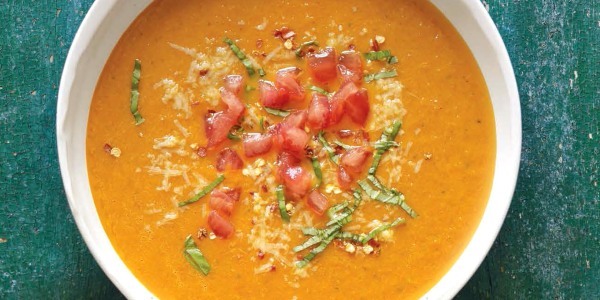 "This ready to eat soup in a box, with a twisty top to re-seal, is a flavorful snack or appetizer any time of year," says Fernstrom. "It has no cream and is low in sodium — just 140 milligrams per serving, less than 10 percent of recommended daily intake — and it's a satisfying and nutrient rich choice." When it comes to snacking, Fernstrom is a fan of this "nutrient dense" trail mix, which comes in single serving 170-calorie packs. "A mix of nuts, seeds, and dried fruit, it's a tasty combo of flavors and nutrients that's perfect for a snack," she adds. "And with the single serving bag, you get the satisfaction of 'eating the whole thing'." As a busy mom, Kirkpatrick is also a fan of TJ's individually portioned "Just a Handful" packs. "On the go, I don't want to carry a tin of nuts — I'll eat it all — and I may not have time to portion into individual bags," she says. "When you're looking for a sweet treat, and fruit is not the solution, satisfy that cookie craving with one of these," suggests Fernstrom. "At 25 calories each, it's a couple of bites, and can tame your sweet tooth. Most often, just a bite or two can satisfy — but feel free to make your portion up to four cookies for 100 calories." TJ's mixed nut butter, which contains a tasty blend of almonds, cashews, walnuts, Brazil nuts, hazelnuts, and pecans, is a fave for Kirkpatrick, who likes the fact that it has no added sugar. Plus, she says, the variety of nuts means you also get a variety of vitamins and minerals. Don't forget your pooch when you're shopping for the family! "Although my dog eats a combo of several types of food that I buy at different stores — I know, he’s spoiled — I recently started buying his dry food at Trader Joe’s," says Taub-Dix. "This food contains whole grains, fiber, probiotics, dried fruits and veggies, flaxseeds and a variety of protein sources and vitamins and minerals. And best of all, I can buy it at the same time that I’m shopping for the rest of the family … saves time and money."